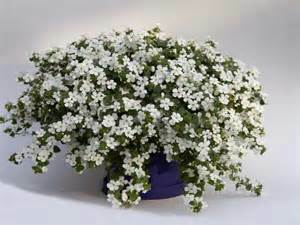 Snowtopia White Bacopa is another great annual to use for baskets and containers. it will grow from " to 6" tall and from 15" to 18" wide. It makes a great filler plant and will trail. Plant Snowtopia White Bacopa in full sun to partial shade. It will bloom from summer to fall and will take a light frost. It has lavender-blue blossoms with a yellow center.